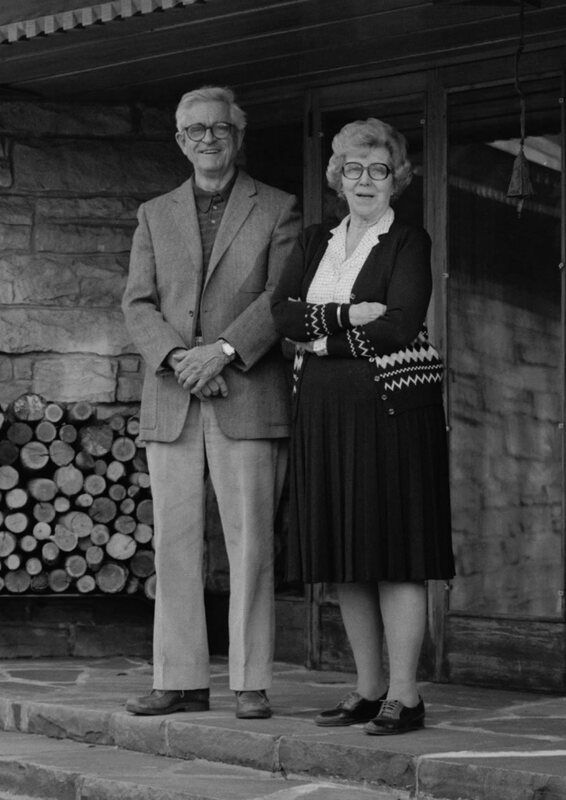 The Hagans spent thirty wonderful years at Kentuck Knob. “There is a sense of beauty, comfort, serenity and harmony in the house and all of its surroundings,” Mrs. Hagan says in her book, Kentuck Knob: Frank Lloyd Wright’s House for I.N. and Bernardine Hagan*. Bernardine Hagan explains the beauty of living at Kentuck Knob as truly being at one with nature. Birds, grouse, hens, turkeys and deer were all common visitors to the home. And of course, the Hagan’s dog Rupert enjoyed the mountain as well. “I.N. and I put so much into that house, our heart and soul, and this will always be there,” she said. After I.N. fell ill the Hagans could no longer remain on the mountain so they sold the home in 1986 to Lord Palumbo of London, England who has continued to maintain the beauty and tradition of the I.N. Hagan House. * This book is now out of print.